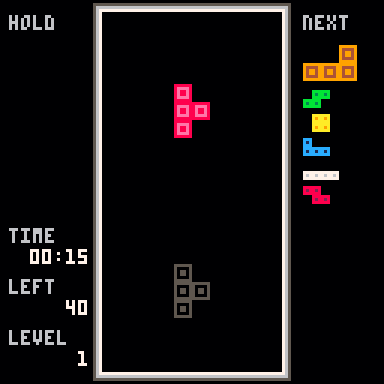 Have been working on a Tetris clone for a while now, and even though I don't consider it finished yet, I wanted to upload it, so here it is! 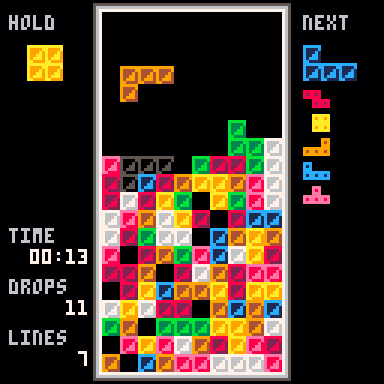 It has a relatively simple aesthetic (basically because I'm too lazy to figure out animations :P) animations now, with multiple sprites to select from. 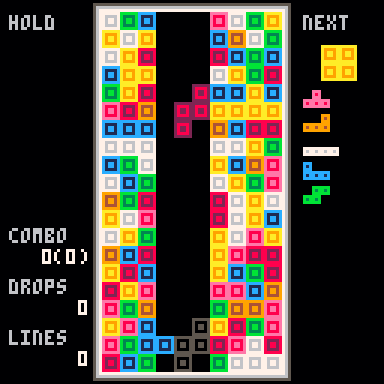 There are about 7 8 modes right now, most of them similar to each other. Gameplay wise, it is has fast DAS (you can adjust that in the options menu though), Standard Rotation System, Kicks, and a steep difficulty curve. When locking hard drop is turned off, let down be the lock button instead. In invisible mode, show the playfield in all its holey glory when the game is over. Sometimes I think up is the rotate button when it's actually hard-drop! 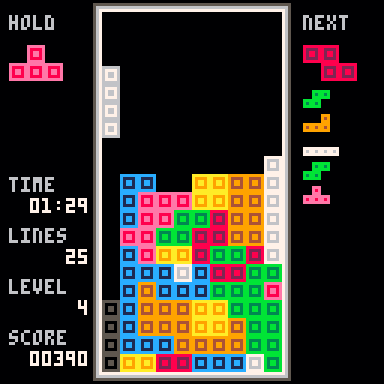 Also, "relaxing game of Tetris" can be an oxymoron sometimes, can't it? WOW! 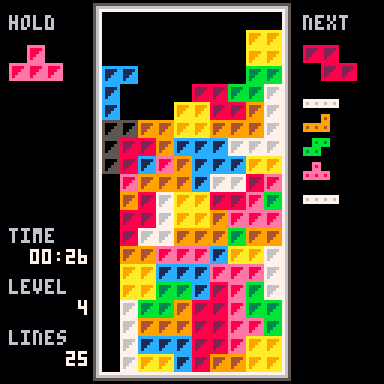 This is seriously one of the best Tetris versions I've ever seen, no joke. I specially love the animations you added in 0.9.5, it makes it so satisfying to play. 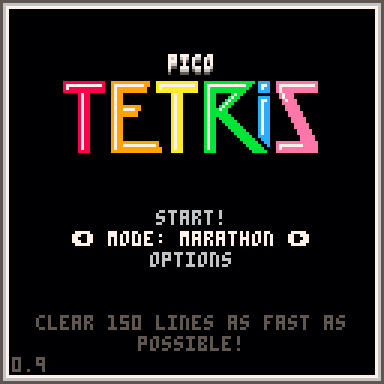 The only thing I miss from other Tetris versions is the ability to save a tetrimino for later, but I understand that it's a PICO-8 limitation that you only have two buttons. Did you base your animations in some resource out there, or did you come up with them on your own? @DavidMazarro thank you! I also noticed I like it so much more now, even though core gameplay hasn't changed a bit - fascinating what a few simple animations can do, right? 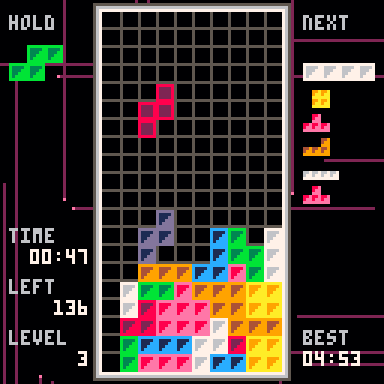 Also, you can actually do that, you need to press both buttons at once (that is what "hold" in the top left corner means). I guess I'll put a small hint in the game, thanks for pointing that out! @Vanessa Ohh, I see! Then this is pretty much perfect! Some suggestion I thought of: it would be cool to have some background pictures for the play area where tetriminos fall. Though maybe it would be better to prioritise other things, knowing that you're already reaching the token limit. Perhaps I'll just try and see how it turns out, thanks for the suggestion! 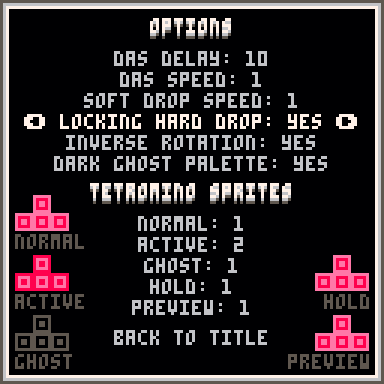 @Vanessa Yeah, once again when I was thinking of a background, I had in mind something with dim colors, but I didn't consider the restricted color palette of the PICO-8. 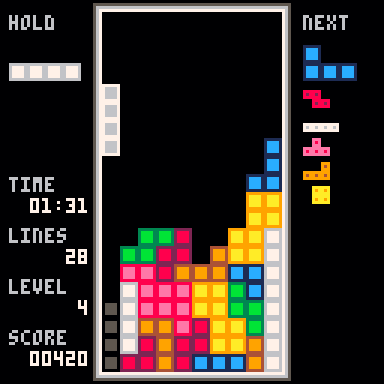 Wow, this is much more eye-candy and features than my Tetris clone! I think I can learn how to do proper animations here, too. Thanks for the great cart!